The 16 birds are now done. You can see the whole collection in the 16 Paintings In 16 Days Gallery. I managed to do all but 2 of them consecutively. The last two were finished after a week’s delay. I had to complete a few deadlines before returning refreshed to my easel to complete the challenge. I consider it successful challenge despite the timing hiccup. It taught me a lot, and yielded a body of work that I am pleased to have. The challenge involved a lot of posting on social media. The day after I finished the last bird, I transitioned abruptly into a “dark week”. It’s part of the Artist’s Way by Julia Cameron (a book that is sure to heal any creative blocks you are facing and help you set goals – it’s awesome!). This “dark week” is a suggested exercise where you avoid going online as much as possible, and you try not to read or listen to music. It helps you hear your inner voice, taking away a lot of the noise of the outside world. It always feels muted and surreal, but this time was especially a large contrast with the prior days of massive online connection. During a quiet period, my dreams become very vivid and I get a lot done. 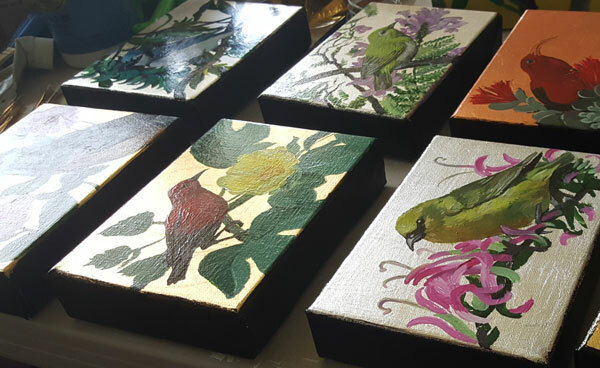 I took part of my quiet time to give the paintings their final touches. I made sure they were all painted on the edges, and signed on the right side. I like the way it looks on the wall with the gallery wrap edge and signature on the right side since the image is so small. I sometimes opt to paint my small pieces this way so that the signature can be extra large without overwhelming the image and I also feel it becomes part of the style of the painting in an unusual way. It gives you a little something to look at from the side of the piece. If people prefer to frame the painting, it’s okay because the signature will be hidden, but it is still there for ID purposes. With this kind of design, framing is optional. It looks modern and finished as is. I finished each painting by applying a very tough topcoat on them. Because some of them are metal-leafed, they need the strength of that topcoat to protect the surface from scratching. The rest also got a layer of topcoat just because it makes the collection more cohesive and I liked the look. The gloss coat deepens the colors and makes them look more like when I placed the paint on the canvas. 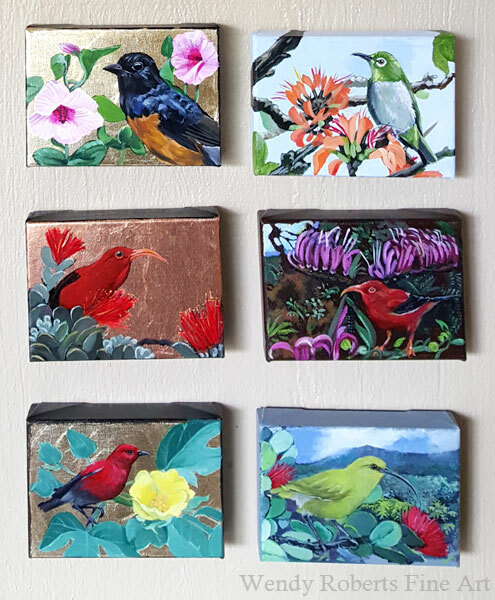 I wired the paintings for hanging and now they are all ready to ship or display or sell – whatever happens to them, they are ready for the world. 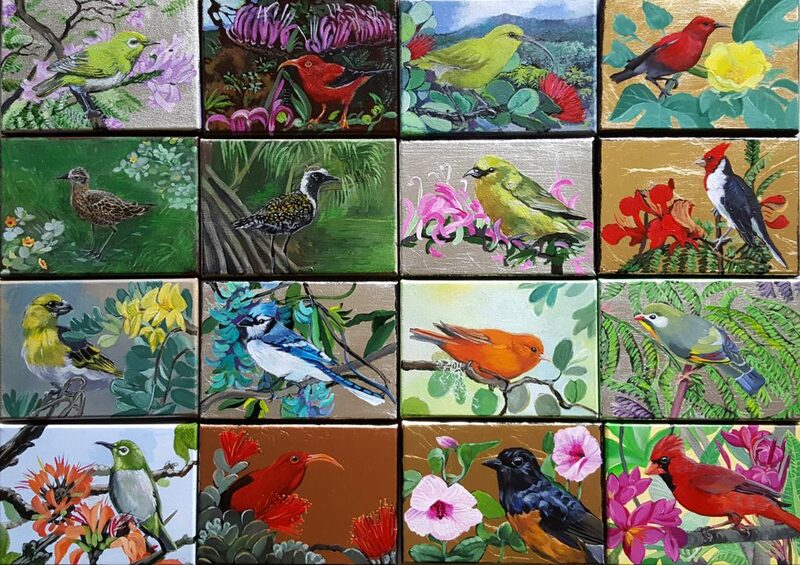 My 16 little bird paintings are perched all over my studio waiting for their debut. They will be taking wing as the centerpiece of my show at Gallery on the Pali coming up in December of 2016. You can see the details in my events calendar. It has directions and all the details, but I hope if you can join us for the reception on Friday December 9, 2016 from 6 – 8 pm. It’s truly fine by me if they sell prior to the show, however. Most paintings are available for sale, and can be shipped priority anywhere in the US for $15. If you need international shipping, please contact me to get a free no-obligation quote. Some of them are also available on gift items or as prints on RedBubble. I’ve been very pleased with the quality of their printing. Click here to see all my available art on RedBubble.